He’s one human caught in a tangled maze of theft, politics, magic, and blood. In other words, it’s just another night. Intrigue, Art, Mystery, Romance – Elizabeth Delivers AGAIN! I needed to wait a while before I could write my review because I felt like it was going to be too biased. I love Elizabeth Hunter, and I knew that would shine through my words. But it turns out that it doesn’t matter if it was 10 minutes or 10 weeks later; I am still going to gush. Midnight Labyrinth is the first full-length novel pairing Ben Vecchio and Tenzin, two of the most beloved characters in EH’s Elemental world. The dynamic duo, shipped as “Benzin” by her fan-base, have shared adventures in three novellas to-date. This novel revisits some old friends, but also introduces some new characters sure to be favorites. In this adventure, Ben and Tenzin seek a valuable piece of art connected to a Jewish artist killed during World War II. While the story’s actual premise is entirely different, it shared a tone with the movie, Woman in Gold. As our favorite pair takes on the search, we also get to delve further into their connection and its growth as they grow as individual characters. While Ben’s development is to be expected, we also see Tenzin connect further with humanity and with her role therein. She forms her own bonds in a way we wouldn’t expect when we first met her in the original Elemental Mysteries books. It’s both unexpected and delightful. I always liked her in an almost terrifying comedic way; I am loving her as she becomes a more humanized version of her ancient vampiric self. We also find ourselves in the midst of vampire politics in New York, something we haven’t seen much of in the past. Ben learns some valuable lessons, perhaps taking his ego down a few pegs. He is still “growing up” and part of growing is making mistakes. Let’s hope our boy learns from them! 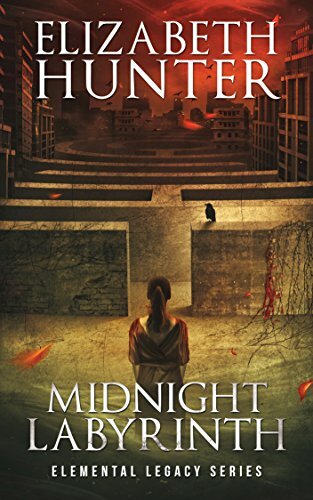 Midnight Labyrinth is non-stop adventure filled with humor, romantic tension and the rich texture we have come to expect from Hunter. If you haven’t started with any of her other books, you can definitely start here. But if I am being honest, I will always say to start at A Hidden Fire and luxuriate in the whole series. If someone were to ask me why they should read this book, it’s simple: immersion. From the moment I read page 1, I was committed. Few authors have the ability to captivate the reader to the point of full oblivion of their world; EH can. Be prepared to commit to this book, because you’ll be unable to focus on anything else until you’re done. Thank the book gods, it seems to be going where – let’s face it – most of us want it to go. I won’t tell you what exactly happens, but I will say that I desperately wanted a thing to be a thing and things to happen with the things and the people. New Years Eve Giftcard Winner Announcement!